Valentine's Day is, ironically enough, probably the least loveable day on the calendar. A fluffy red and pink nightmare fabricated to shift mawkish tat to people so bovine-stupid they need to Hallmark's permission to let their loved-ones know they care about them. As one of the nation's leading curmudgeons, sometime sexpert for The Quietus Aidan Moffat is the last person you'd expect to fall for it, but, contrary to the last, he's twisted the usual tales of drunken infidelity and emotional squalor to celebrate love and all its funny little quirks, releasing the album on February 14th (the limited edition version comes with a signed Valentine's Day card, a board game, and a bonus 7-inch featuring Sonny And Cher's 'I Got You Babe' and Glen Campbell's 'Love Is Not A Game'). Naturally, this being half of the team behind the gloriously dour Arab Strap, he handles it all without sentimentality, his raw, gruff voice documenting the most important people in his life in a manner that's all the more touching for its candour. The tender 'Lullaby For An Unborn Child', complete with the unmistakeable heartbeat of an ultrasound on percussion, is as intimate as it's possible for music to be as Moffat shares his hopes and fears of impending fatherhood with his future son. 'Atheist's Lament', meanwhile, finds the avowed heathen almost wishing he had some kind of faith after the death of a much-loved relative. And then there are the warts-and-all accounts of finding romantic love, broken relationships littering the path to the one that works on the stripped back 'Now I Know I'm Right'. 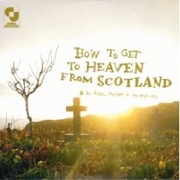 The charm of How To Get To Heaven From Scotland is Aidan Moffat's continued willingness to not only admit to his flaws, but to shine a bright light on them so there's no way of missing them. Even at his most content, he documents the fights, the self doubt ("Why would you waste your time on me?" he wonders on 'That's Just Love'), and the pitfalls that make up real human relationships. And it's those very imperfections that make this album, against all odds, the most truly romantic around right now.